Low T Center founder and CEO Mike Sisk and Gas Monkey’s Richard Rawlings have joined for the 100th Running of the Indy 500. Both companies, based in Dallas-Fort Worth, have found synergy with reaching sports-minded men who have a passion for life and cars. 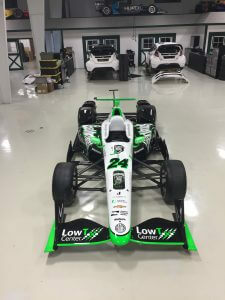 On May 29 at Indianapolis Motor Speedway, Low T Center will be featured as an associate sponsor for Gas Monkey Energy and Dreyer & Reinbold-Kingdom Racing in the No. 24 Chevrolet. Sage Karamm 21, is the scheduled driver and is new to the Gas Monkey family as well. In the 2014 Indy 500, Karam started 31st and finished ninth. “I’ve known Richard for quite some time now and have watched him build his brand and business,” Sisk said. “I’ve always admired Richard’s passion and enthusiasm. I believe this collaboration will help Low T Center broaden awareness about men’s health concerns and encourage men to be more proactive with their health. Low T Center is a leader in the provision of physician-led diagnosis and treatment of low testosterone. Studies indicate testosterone deficiency has been linked to diabetes, metabolic syndrome, obesity, and high blood pressure. Low T Center was designed so men can walk in, take a simple blood test, and know within 45 minutes if they are a candidate for testosterone replacement therapy. Experience shows testosterone injections may lead to improved energy, strength, and libido, as well as decreases in body fat, irritability, and depression. Founded in 2009, Low T Center has quickly evolved into a pioneering and innovative medical practice model. As demand for information about testosterone therapy grows, Low T Center has established itself as a leader in treatment and public awareness. Nationally there are 46 Low T Centers operating in 10 states.